If you’ve been hit with the pain of climber’s elbow you are probably wondering how to get over it as fast as possible. Cortisone shots may have been offered by your doctor. Cortisone shots can be magical in getting rid of elbow pain…for a short time. It’s great to be pain free, but it’s not great if your pain returns in a month and puts you right back where you started. And just because you don’t feel pain doesn’t mean you aren’t causing more tendon damage. Medication can be helpful in decreasing pain but only physical therapy for elbow pain can really fix the tissue imbalances that led to the damage. 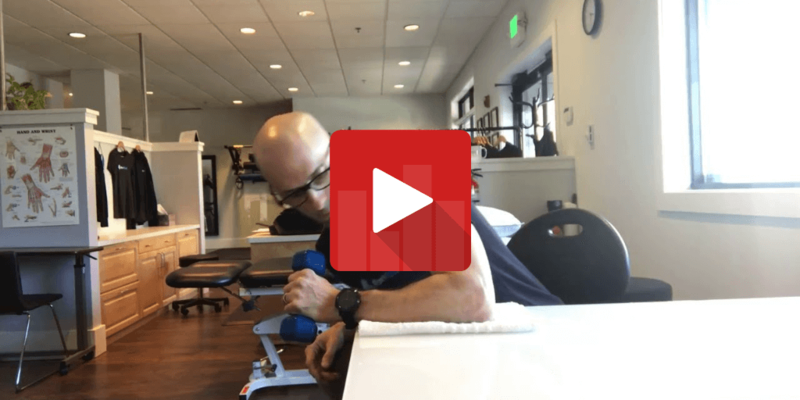 Elbow strengthening exercises (specific to climbers!) should be issued in order to prevent reoccurrences. The most important way to start caring for climber’s elbow and lateral epicondylitis / lateral epicondylosis is to be assessed by a physical therapist or occupational therapist who specializes in treating this condition. It’s even better if you can find one who has experience climbing themselves and can relate to the demands of climbing. Learning elbow pain treatments and elbow strengthening exercises will initially focus on loading the hand, wrist and forearm WITHOUT increasing the level of pain. This will mean swallowing your pride and treating your elbow pain with some TLC. Too often people think “no pain, no gain” and end up pushing through pain only to further destroy the elbow tendons and end up with chronic pain. It’s not worth it! If you have the disciple to climb hard you need the disciple to recover hard. One of the many exercises used to treat elbow pain is eccentric loading of the damaged tendons and muscles at the forearm and elbow. There are dozens of exercises and an infinite way to dose those exercises to treat climber’s elbow and elbow tendonitis. Look for further videos and blogs for treating elbow pain in climber’s. Call, email or comment if you want further details on this condition.